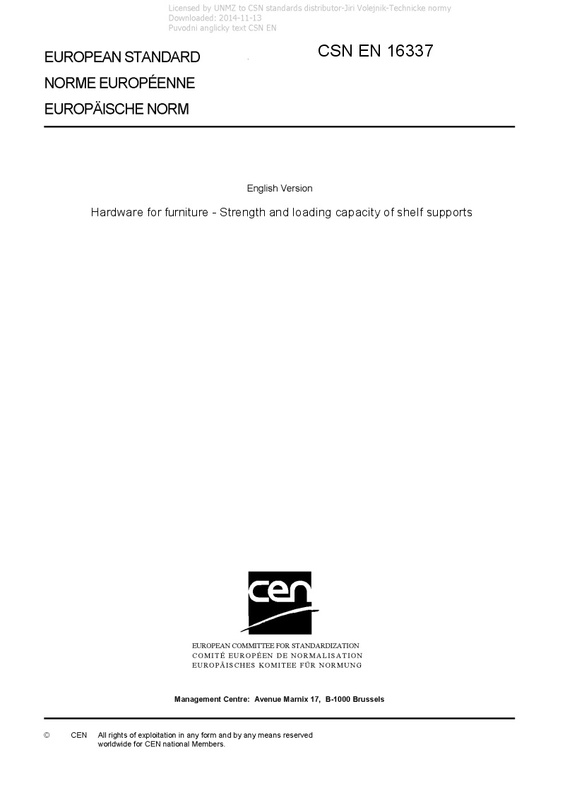 EN 16337 Hardware for furniture - Strength and loading capacity of shelf supports - This European Standard specifies test methods for the verification of the loading capacity of shelf supports. This standard does not apply to ceiling attached shelf support systems. The tests consist of the application of vertical loads and forces simulating normal functional use, as well as misuse that might reasonably be expected to occur. With the exception of the corrosion test in 6.4, the tests are designed to evaluate properties without regard to materials, design/construction or manufacturing processes. The strength tests include only the shelf supports and their components as well as the attachment to the cabinet and/or to the wall. If the shelf support has additional functions, e.g. as a connector or as an extension element, these are not covered by this standard. The test results are only valid for the shelf supports tested. The results may be used to represent the per-formance of production models provided that the tested model is representative of the production model. The test results can only be used as a guide to the performance of the shelf supports. With the exception of the corrosion test, ageing and influences of temperature and humidity are not included. Annex A (normative) includes requirements for product information. Annex B (normative) includes test parameters. Annex C (informative) includes method for the determination of loading capacity.